On Monday, the Union Cabinet invoked Article 356 to impose President’s rule in the north-eastern state of Arunachal Pradesh, following Sunday’s cabinet meeting chaired by prime minister Narendra Modi. A day later, President Pranab Mukherjee gave his assent to the cabinet decision. The Centre also appointed former Delhi police commissioner Y.S. Dadwal and former home secretary G.S. Patnaik as advisers to the Arunachal Pradesh governor Jyoti Prasad Rajkhowa. This will be Arunachal Pradesh’s second term under president’s rule. It was last imposed for a brief period between November 1979 and January 1980. According to Article 356 of the constitution, President’s rule can be imposed in a state “if a situation has arisen in which the government of the state cannot be carried on in accordance with the provisions of the constitution." The first signs of an ensuing crisis in Arunachal Pradesh emerged after chief minister Nabam Tuki sacked Kaiko Pul, the state finance minister. It resulted in a vertical split within the Congress legislature party, with 21 of the 47 legislators rebelling against Tuki. The rebel Congress legislators have since openly sided with the 11 legislators of the Bharatiya Janata Party (BJP) and two independent members. In the event of a floor test, the Tuki government clearly stands to lose as of today. Besides the split within the Congress, the state assembly is also facing a constitutional crisis, with the speaker Nabam Rebia failing to convene the house within six months of it being held earlier. As per the rules, the Arunachal Pradesh assembly should have been in session by 21 January. Manipur has seen a total of 10 instances of president’s rule--the first of which came in 1967, immediately after the first election was held in what was then a Union territory. Since it received full-statehood in 1972, Manipur has seen seven such occasions, the last one in 2001, when the incumbent government lost its majority. Uttar Pradesh and Punjab (includes the erstwhile Punjab and East Punjab States Union or PEPSU) have nine instances of president’s rule each. The only states where president’s rule is yet to be imposed are Chhattisgarh and Uttarakhand (formed in 2001) and Telangana, which came into existence in 2014. When does President’s rule get imposed? Typically, president’s rule is imposed when a state government loses its majority or in the case of a split within the ruling party or withdrawal of support by a coalition partner. There have also been instances, most notably in the 1970s and 1980s, where state governments have been dismissed, in spite of having a majority in the assembly. President’s rule also comes into effect in the event of a post-poll scenario, where no party or coalition is in a position to form a new government. There are also situations where a chief minister has tendered his resignation for various reasons like disqualification by the courts or in Arvind Kejriwal’s case, failing to pass the Jan Lok Pal bill in February 2014. Besides, the prevailing (often deteriorating) law and order situation within the state is also considered. 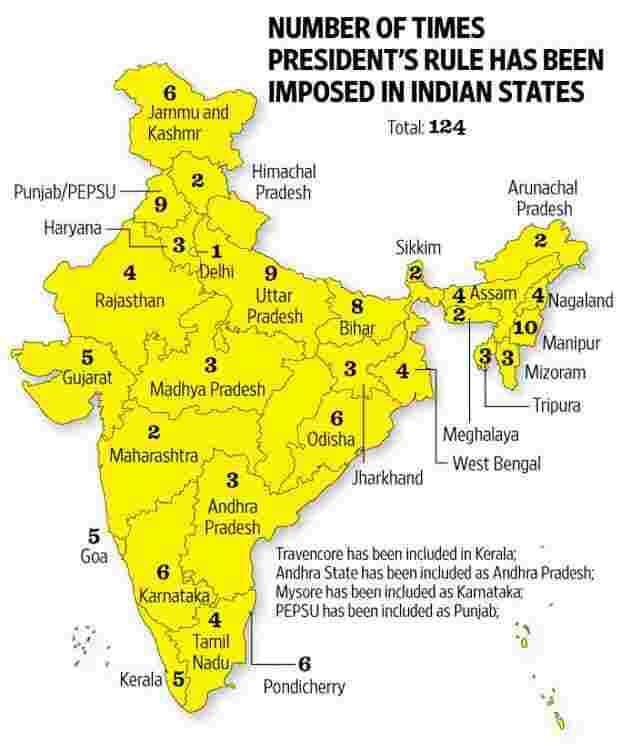 This includes secessionist insurgencies (Punjab, Jammu & Kashmir, northeastern states), violence due to ethnic clashes (Assam, Tripura) and communal riots (Uttar Pradesh). How has it been imposed over the years or who has imposed it? India’s first prime minister Jawaharlal Nehru, during his 17 years in power, invoked Article 356 eight times. His successor Lal Bahadur Shastri, who was at the helm for two years, imposed President’s rule in Kerala (in September 1964). Indira Gandhi, India’s first woman prime minister, however, holds the record for invoking Article 356 the maximum times. During her collective stint of 14 years as prime minister, president’s rule was imposed a total of 50 times (35 between 1966 and 1977, and 15 between 1980 and 1984). More recently, after the landmark Supreme Court verdict on the S.R. Bommai case in 1994, the article has been used sparingly, or in exceptional circumstances. The contention that president’s rule was being misused by parties in power was accepted, with the court issuing strict guidelines on its imposition. 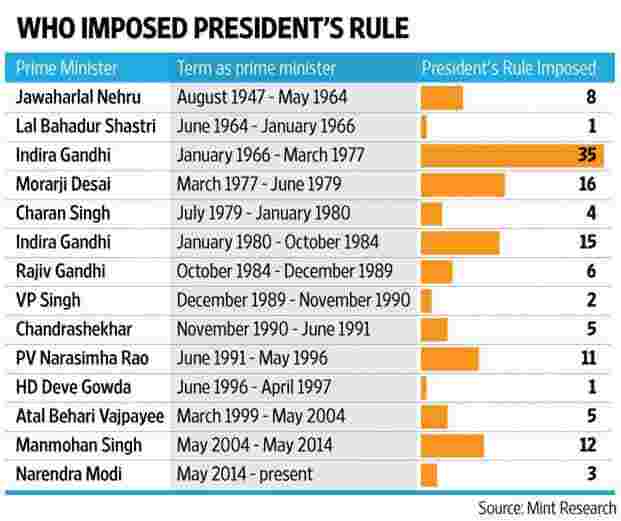 The Manmohan Singh-led United Progressive Alliance (UPA) government had invoked the president’s rule 12 times in different states. Similarly, the Narendra Modi-led National Democratic Alliance government has resorted to the president’s rule three times during its 20-month rule. Besides Arunachal Pradesh, president’s rule was imposed in Maharashtra after the Congress-Nationalist Congress Party alliance split ahead of the assembly elections in October 2014. It was also imposed in Jammu and Kashmir after latest assembly election when the discussions over the government formation was on.